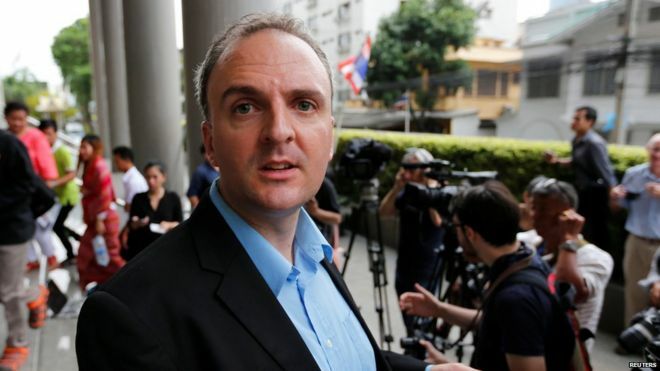 On 7 November 2016, the BBC, Reuters and other media reported that labour rights defender Andy Hall has left Thailand after a three-and-a-half year legal battle with a pineapple processing company accused, in a report he contributed to, of abusing its workforce. The dismissal of one set of charges against the British activist was confirmed by Thailand’s Supreme Court last week. But he was convicted in September on two other counts under sweeping criminal defamation and computer crimes laws and was given a three-year suspended prison sentence. He also faces civil complaints by the pineapple company, Natural Fruit, which is demanding around $12m in damages. Before he left Thailand Mr Hall told the BBC that he felt that the prospect of having to contest continuous lawsuits filed against him would make it impossible for him to defend migrant workers’ rights effectively. The situation for human rights defenders, he said in a statement made as he prepared to depart, has rapidly deteriorated in Thailand, with significantly increased risks. 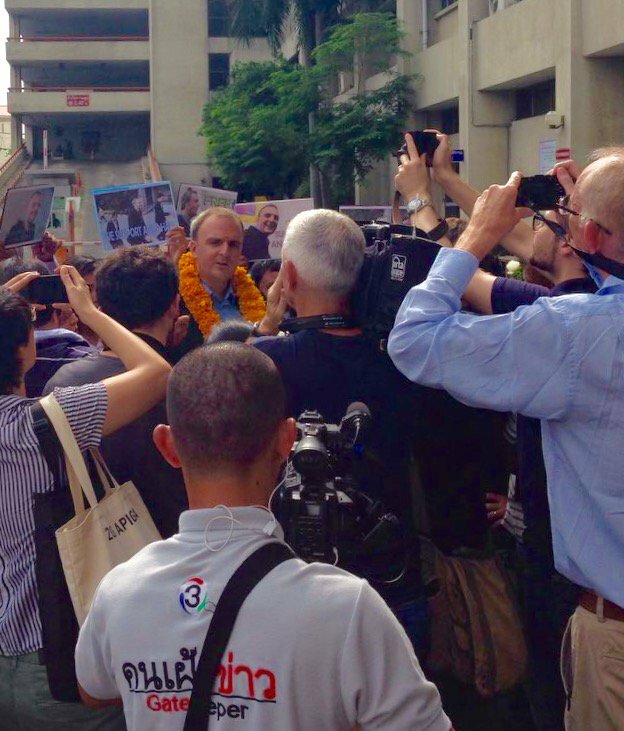 The challenge confronting Mr Hall is one faced by many Thai activists as well. Defamation is a criminal charge that can carry a two-year prison sentence, often used alongside the even tougher Computer Crimes Act, which mandates a sentence of up to five years in prison. Two years ago, the editors of a small newsletter, Phuketwan, were prosecuted by the Thai navy for an article in which they quoted a Reuters news agency report alleging Thai military involvement in human trafficking. They were finally acquitted last year, but the effort of defending themselves contributed to the newsletter being shut down. In June this year three prominent human rights defenders were prosecuted under the same two laws by a unit of the Thai military over a report they took part in which alleged the use of torture against military detainees in southern Thailand. On 6 October EU Trade Commissioner Cecilie Malmström had strongly backed the British labour rights activist who helped expose labour abuses in Thailand, for which he received a three-year suspended jail sentence. Andy Hall met Malmström in Strasbourg, where MEPs also passed a strong resolution condemning Hall’s treatment under the military junta now running the country. The case raises questions about Thailand’s punitive criminal defamation laws and the ease of being condemned for violating the Computer Crimes Act because the information was posted on the internet. Hall was given a suspended sentence of three years with a probationary period of two years, and a fine of 150,000 baht ($4,300). He said he will appeal the ruling. He was allowed to go free after his fine was paid. Two civil suits by the company against him are pending, as is an appeal against his acquittal on a previous criminal defamation charge. Finnwatch was not sued, nor was the Al Jazeera news network, to whom Hall gave an interview that was the basis for part of the cases against him. The Special Rapporteur on the situation of human rights defenders, Margaret Sekaggya, on 16 October 2013 called on the Togolese Government to ensure a favourable environment in which human rights defenders can carry out their work. The Government can do this by fully implementing the existing legal framework, avoiding stigmatisation and fostering a spirit of dialogue and constructive criticism, she said at the end of her five-day mission to assess progress made in Togo since her last visit in 2008.